The greater kudu population in the northern part of its range has declined due to excessive hunting and rapid habitat loss. However, they are evaluated as low risk in the IUCN Red List of endangered species. The long-term survival of the greater kudu at large is not in jeopardy as populations located elsewhere remain robust and well-managed. Fortunately, the greater kudu receives adequate protection from southern Tanzania to South Africa. There are large populations in parks and reserves such as Ruaha-Rungwa-Kisigo and Selous (Tanzania), Luangwa Valley and Kafue (Zambia), Etosha (Namibia), Moremi, Chobe and Central Kalahari (Botswana), Hwange, Chizarira, Mana Pools andGonarezhou (Zimbabwe) and in Kruger (11,200 – 17,300) and Hluhluwe–iMfolozi (South Africa). 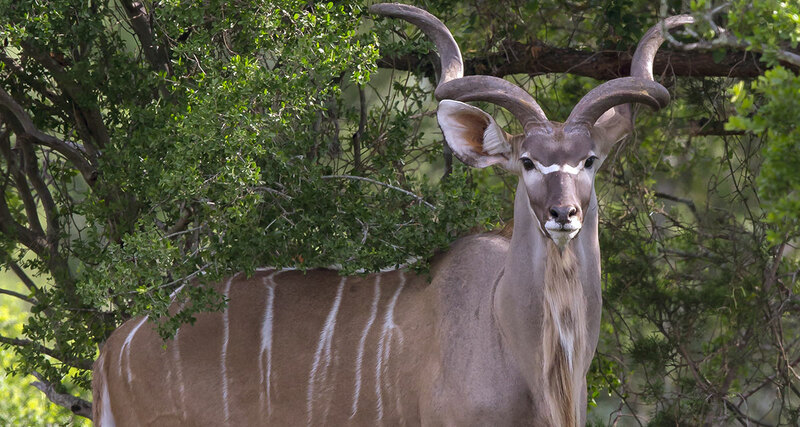 An abundance of greater kudu is also found in private farms and conservancies in southern Africa, in particular in Namibia, Zimbabwe and South Africa, where they are popular amongst trophy hunters.